Hello everyone!! Abby here bringing you a super cute treat! 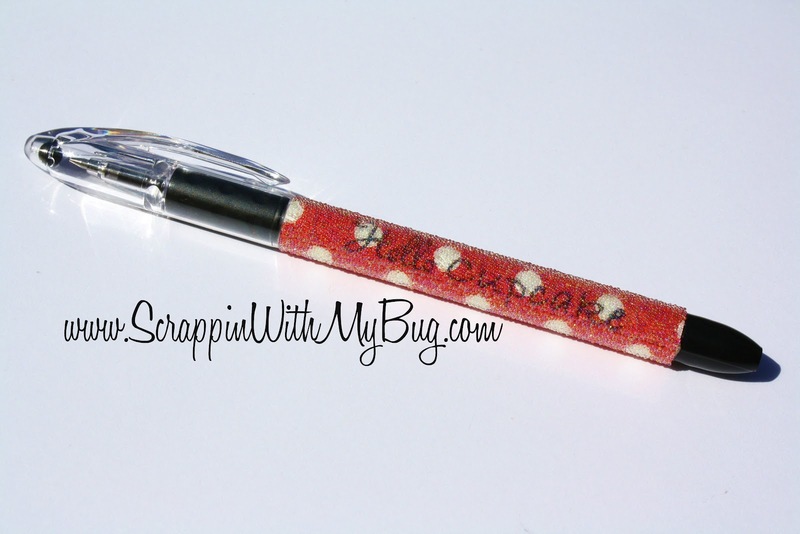 I used the new Flag Die 2, the 3x4 clear plastic bag and Miscellaneous Fun stamp set. Today is my day to post for the Jaded Blossom Design Team and I am excited to share a cute Halloween card and a quick tip when using the Jaded Blossom Dies. So lets start with what I used! I cut the cat from the Silhoutte Store, used DCVW paper for the background, used Trendy Twine Grape Licorice for the bow, and Martha Stewart drippy goo punch for the well...drippy purple paper! I use the Jaded Blossom Dies a lot! In case you have never used them, I wanted to show you how quick and easy it is to get a perfect cut everytime! And here is my tip for the day. It doesn't seem like much but if you have ever struggled with getting your dies to stay put on the plates it is a sure fix. 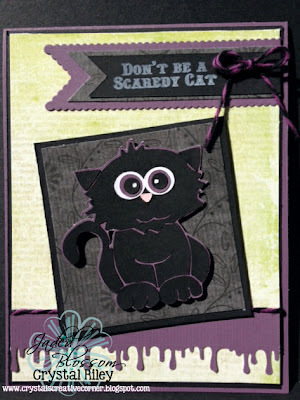 Hi Everyone, Today we have our September Guest Designer Jane of Creations by Janey! She has some awesome projects to share with us today. For her first yummy project she used one of our Favor Boxes, Thanksgiving Wishes Stamp Set and our very first Flag Die. Isn’t that the cutest, love that die cut! For her second Adorable Project she used the Thanksgiving Kisses Stamp Set. That 3D Pilgrim Hat Box looks Awesome. For her last Project of the day, she used the Happy Owl-O-Ween Stamp Set. Isn’t her card just Adorable, I really like the shape of the die she used to mat her owl die cut. The paper she used is so cute too. Amazing creations, make sure you check out Jane’s Blog for more information and to give her some love. Hello everyone! Abby here with a Thanksgiving Kisses project! I LOVE these little stamps that just fit perfectly under your kisses! I created this little bag with kisses! If you haven't had a chance to take a look at all the different kiss stamps JB has, you better!! You don't know what you are missing!!!! Jamie here to share a new project and a very simple tutorial with you. 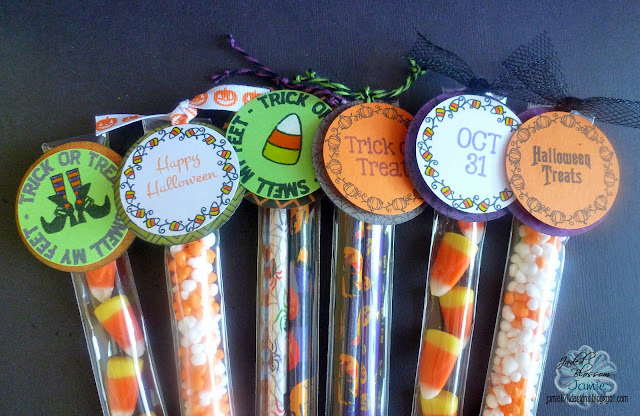 I made some Halloween Treats with the 1x8 stick bags. 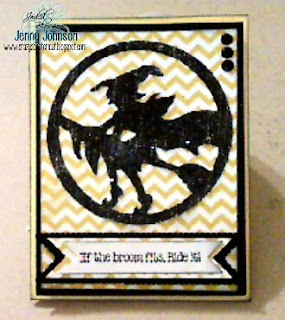 I used Halloween Treats, Best Witches and Thanksgiving Wishes for my toppers. I used a 1 3/4" punch for the smaller circle and stamped on my circle stamps and sentiments. Then I colored them in with glaze gel pens. The bigger circle is a 2" circle punch. 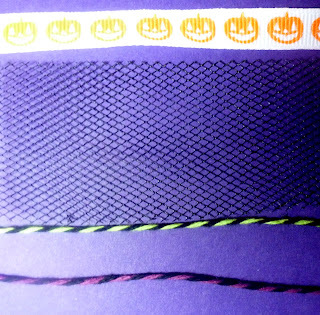 Depending on how you want to attach your toppers, punch or hole at the top of the bigger circle if your going to attach using twine, ribbon or tulle. Leave plain like on the right if your going to use glue. Then just glue the smaller circle onto the bigger one or you can pop dot them like I did. 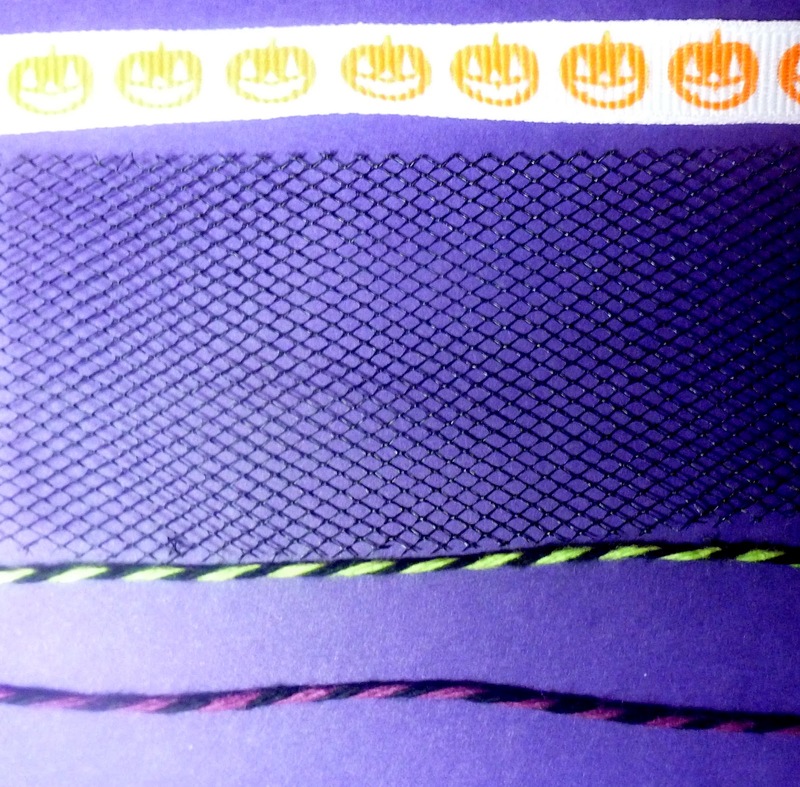 Here's what I used for tying my toppers on. Then fill your sticks with whatever you like. Punch a hole through the top of the plastic if your going to be tying your toppers on. Then all you need to do is tie your toppers on or glue them in place to finish them off. And there you have a super easy and cute treat! For more details on my project, please stop by my blog! And here's a video on how I made it! Thank you to EVERYONE who participated in this months challenge! Here is Naomi's wonderful project.. Thanks again to everyone who played this month. Please join us for another challenge on October 7th! Thanks again for joining us during our September Release Celebration! Hi there! Kim here from Puppies and Paper Crafts! I used their new release Halloween Treats for this fun treat today! You can buy that set here! 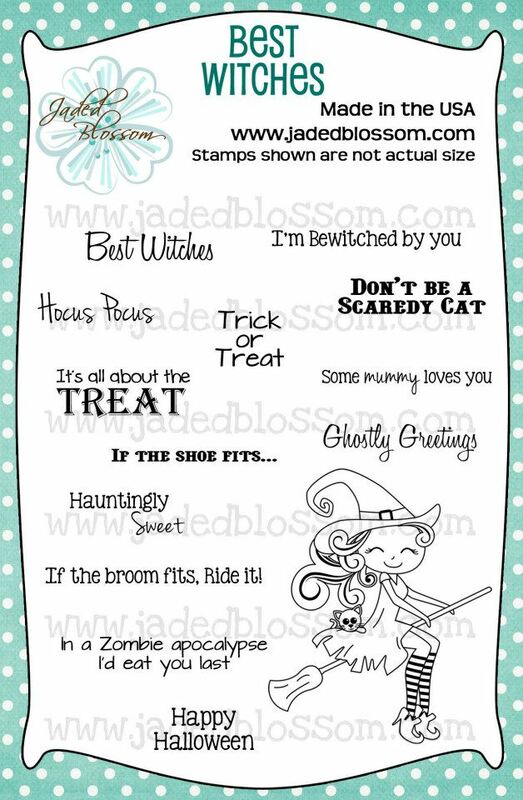 I stamped the circle sentiment first and then added the cute witch feet. I punched this out using a 1 3/4 punch and then placed that on a 2 inch scalloped circle punch. I also used some orange and black twine to tie it all together! 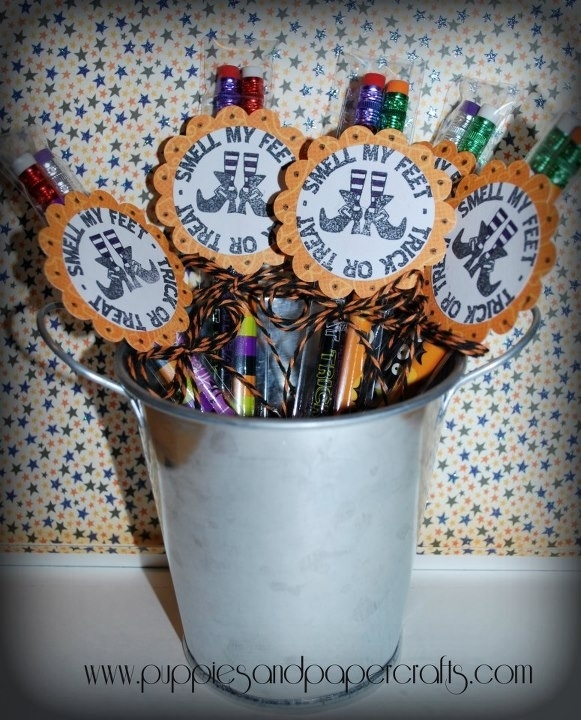 I added the tag to a 1 by 8 clear bag filled with two spooky Halloween pencils! Wouldn't these be great to give out or pass out in the classroom? Don't forget about the Jaded Blossom Challenge this month! 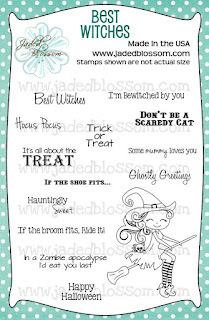 It's a Crafter's Choice Challenge so all you have to do is submit a NEW project using a Jaded Blossom Stamp! Hi there! :0) It's Crystal from Crystal's Creative Corner! I am happy that is it my day to post for the Jaded Blossom Design Team! I love being a JB DT member! These stamps are AMAZING! I love creating with them! Here is the card I created today! I used the new BEST WITCHES stamp set for the sentiment. The witch legs were cut from the Silhouette Store. I used the new Flag Die 2 Scalloped Edge. and the FLAG Die for the inside flag. Today is National Video Game Day!! Which is totally crazy because it is also my oldest nephew's birthday and I swear he was born with a Gameboy (he is old--hahah!) in his hand! SO I made him this fun controller birthday card! I cut this from the Silhouette Store. On the inside is a HAPPY BIRTHDAY stamp from Jaded Blossom. Thanks for stopping by to visit today! We love to hear from you so--leave a comment! Don't forget that the challenge this month is the Jaded Blossom CRAFTER'S CHOICE! Hi Everyone, it's Kate to share a project with you! Please join us in our Challenge, it's Crafter's Choice and you still have tons of time to play with us! 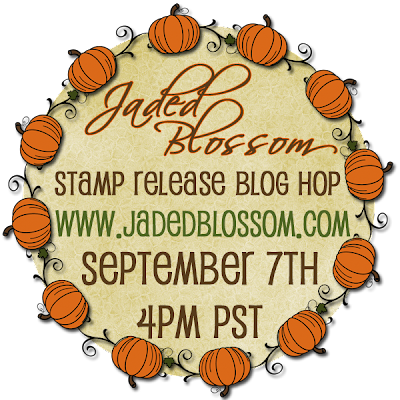 I know you all got excited but your going to have to wait until later for our Awesome Blog Hop and to buy some Jaded Blossom Stamp Sets. You won't wanna miss it. But just to get your creative juices flowing, don't forget to check out Each Day's Stamp Reveal Day! Also don't forget to join our September Crafter's Choice Challenge for a chance to win Jaded Blossom's "Sweet Celebration" Stamp Set. We can't wait for you to see our projects for the Hop later, The Prizes, The treats you will receive when you purchase during release weekend and our Special Bundled Prices. Wow, Day 4 of Release Day. I hope you are all enjoying the Design Teams Projects. Aren't they Amazing? We told you, your going to love this release. Tomorrow is the day that ALL 8 Stamps Sets and Brand New Die will available for purchase. Are you guys Excited?